Fox investors left hanging: What's next on Time Warner? 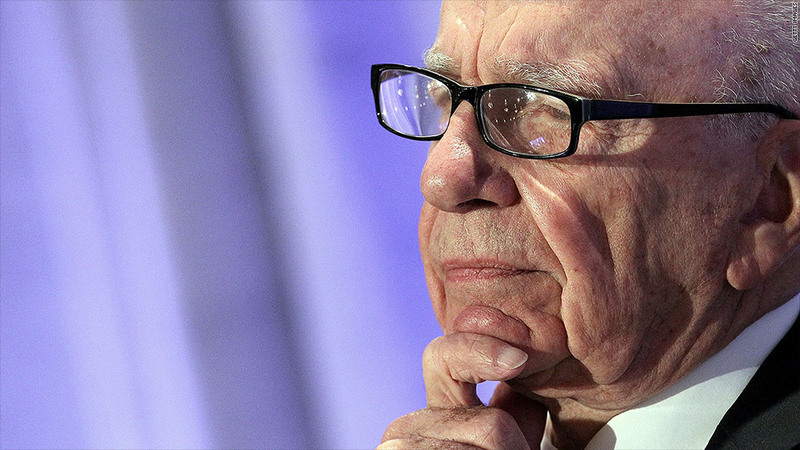 Whether Rupert Murdoch folds or raises the ante for Time Warner is likely to be the biggest question on investors' minds this week when 21st Century Fox announces the results of its second quarter. Investors have punished Fox shares since news of the initial bid surfaced in mid-July. The stock was above $35 in the days before the news. Now: nearly 10% lower. One large Fox investor said the market is worried about Murdoch's discipline when it comes to deal-making. The investor pointed to his purchase of Dow Jones and the Wall Street Journal for more than $5 billion, which led to a $2.8 billion write-down to profits. That deal pales in comparison to Time Warner: Murdoch's initial bid was $80 billion. Before the Time Warner bid, Fox was on the road to rebuilding relations with shareholders but the possibility of another run at Time Warner puts downward pressure on the stock, wrote analyst Michael Nathanson in a report last week. Nathanson is partner at MoffettNathanson Research. "Under this scenario, FOXA is in purgatory for now,'' wrote Nathanson. The drop in Fox (FOXA) shares will only make a renewed takeover attempt tougher. Since Fox used a mix of stock and cash for the original offer, the overall value of the deal declines with the company's shares. If Murdoch wants to feel love, he could always turn to Fox's debt holders. Murdoch is known for managing debt very carefully. Moody's analyst Neil Begley said Fox has maintained a good credit rating since Murdoch's company recovered from a brush with bankruptcy in the early 1990s. So how much higher could Murdoch go? Fox could afford another $17 billion, on top of the initial $80 billion, without triggering a credit rating downgrade, according to Begley. That's if Fox keeps the current stock and cash split. Of course, Fox could also throw in more stock, which would increase the value of the bid without impacting the company's credit profile. Even though Time Warner rejected Fox's proposal on July 16, it's stock rallied nearly 20% and has held steady. In response to the offer, CEO Jeff Bewkes said Time Warner's strategic plan will generate more value than any proposal from Fox. Time Warner also reports results on Wednesday. But analyst Rich Greenfield said Jeff Bewkes works for shareholders and, ultimately, they want to see a deal happen. If Fox comes back with a higher bid, it's going to be hard for Time Warner to avoid opening the door to talks. Fox may also have more to say at a day of meetings with investors on Friday. Time Warner (TWX) is the parent company of CNNMoney.